Was a bit sniffly last night, but powered through. But by the time I’d written my words for the day and went to bed, I was so sick I couldn’t sleep. So today has been pretty rough. Horribly sick, tired, lots of work to do and no words until just a short while ago, when I wrote 862 of them. This is why it pays to get ahead, though I wish I’d banked just a bit more before suffering the inevitable NaNo cold. I remain hopeful that I’ll be able to finish tomorrow anyway, and I’m still working tonight, so we’ll see how it goes. Total word count (so far): 47,152. So, I wrote my words during the 2-hour Dancing with the Stars finale, I must confess. Since I’m sick and can’t tango tonight, I wanted to enjoy the show live because my mom and I text when we’re both watching it. Not only am I thrilled that I got to see Melissa win (! ), the multi-tasking seems to have focused me. I wrote 1,137 words during that two hour episode! Total word count (so far): 48,289. Y’all, I can’t believe this, but I only have 1,711 words left! I could possibly finish this tonight. I have two hours to try! Who wants to word war? 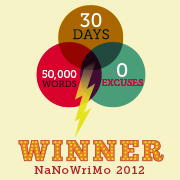 Sure enough, the validating technology has me winning with 9 fewer words, but I’m okay with 50,081. Good luck to those of you still pushing for the 50K. You can do it! I know you can, absolutely. Today was a good, productive day. I tackled a few items on my freelance to-do list, went by the grocery store and then a book event, Summer Wood’s reading from her novel Raising Wrecker at Garden District Bookshop. I saw a lot of writers I know in that crowd and Summer gave a fantastic reading. I can’t wait to read the book. When I got home, I watched the documentary First Position cause it needs to go back to the library tomorrow. It’s about 6 young ballet dancers who are competing in the Youth American Grand Prix. It’s very good and left me wondering what’s going on with those dancers, though I know one performed on Dancing with the Stars recently. Then, I wrote. The scene that was next up was an interesting one, because it’s an action sequence that I had to figure out, so I’ve been thinking about it all day. I’ve been excited to write it, but also dreading it a bit because I’ve been planning to kill of this character who I’ve really started to like. So, during the writing session, I couldn’t seem to put her in danger. Other characters kept offering themselves up, sort of saying, “Take me instead!” And I’d kill them off too, raising the body count, then say to myself, “But you really do need to kill off X, so stop procrastinating.” Yes, writers are weird and this is the stuff we think about when you think we’re just staring off into space. Oh, by the way, cause it’s probably important to note, I’m writing a zombie apocalypse novel. Status: Still behind, but not doing too badly.